Some of the biggest jackpots paid out to online casino players are those that are linked to the Playtech slots network. One of these games is Beach Life, a fun, brightly- colored slot game that is as fun to play as it is rewarding. The jackpot on Beach Life slot currently stands at nearly R24 million and even better news is that the prize is long overdue for a win! With a jackpot that is begging to be won on a game that is hugely entertaining to play, what are you waiting for? The last time that Beach Life slot was won at a Playtech powered online casino was 38 weeks ago. A closer look at the average time that this slot jackpot hits shows you that it stands at a payout every 20 weeks or so. This means that at any given moment, the Beach Life slot progressive jackpot can pay out. The funky and wholesome Beach Life slot immediately brings to mind the iconic boy-band The Beach Boys as they crooned on the sands, with the blue sea as their backdrop. 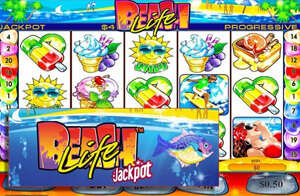 The five reel, 20 pay line Beach Life slot is popular because of its progressive jackpot, as well as its many bonus features. • The Sun Wild symbol: This symbol stands in for other symbols to create winning combinations (except for the bonus symbol and the scatter symbol). Land five Wild symbols on the 20th line to win the progressive jackpot. Landing five of them on any other line will award you with a 100,000 coin payout. • The Bonus Treasure Chest symbol: You need at least three of these to trigger the lucrative bonus round. You will receive prizes in this feature depending on how many Bonus symbols you land on the reels. • The Sand Castle Scatter symbol: You can land this symbol on any pay line to win a prize of anything between 2 and 500 coins that are multiplied by your total bet. Landing even two Sand Castles earns you a line win. Keep your eye out for other Playtech jackpots that are waiting to be won, including Cat in Vegas slot, Deal or No Deal slot, Esmeralda slot and Frankie Dettori’s Magic Jackpot slot.